MeyCom is an owner managed and run business. The three partners have 70 years' experience directly related to their industry between them. 80% of the company's business comes from existing Customers. Our reputation is built on providing value, completing contracts on time, and an efficient after-sales service. The company has offices in Johannesburg, Durban and Cape Town. Maintenance & Service is the cornerstone of the company. ISO 9001:2008 certification ensures an ever improving quality of service being provided to our customers. 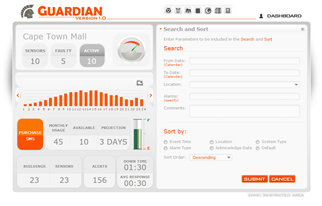 MeyCom now includes the Guardian Monitoring Service free with all fire system Service Level Agreements (SLAs). Why not take advantage of our free evaluation of your fire detection and evacuation systems? The Company offers an inclusive service from conceptual designs and budgets through to project management and installation of your project. Services is the cornerstone of the company. MeyCom distributes and supports a number of innovative web-based products. Guardian Manager is the latest product, providing real-time remote monitoring of the operational state of equipment, plant and systems. Guardian Manager ensures that your plant, equipment and systems are working all the time. Reduced maintenance costs. Cost effective pricing. Health & Safety - assist in compliance. Legal Claims CPA - assist in proving diligence. Insurance Claims - assist in proving diligence. Guardian continually monitors your systems and informs you immediately of equipment failure by Email and SMS. Live remote fault monitoring, viewed on your smartphone, desktop and tablet. Over the past 8 years we have successfully integrated IP Technology with the traditional Digital and Analogue Technologies. We are able to offer the best technological solutions to our clients. The company adopts an essential cost saving approach when upgrading existing systems. existing systems can often be incorporated into new systems. Cape Town Water Crisis, Building Fires. Please take us up on this free offer. Ensure that your fire detection is fully operational. Early detection of fires in buildings essential where water supply is limited. Don’t take the chance that there will there be a continuous supply of water for the sprinklers or the hose reels, at suffiecient pressure for them to operate effectivley over long periods, to extinguish the fire. During the water crisis we are offering our customers a free monthly cursory check of their fire panel. This offer is extended to prospective customers who maybe concerned about the state of their fire detection systems in Cape Town. Don’t hesitate to call us if you have any concerns.